Thank you to those of you who attended the 2012 Unconference. Please take a moment to read the Unconference 2012 Summary about the activities on the day. Let your voice help shape the organization’s activities. CADA/BC planning it’s first unconference. 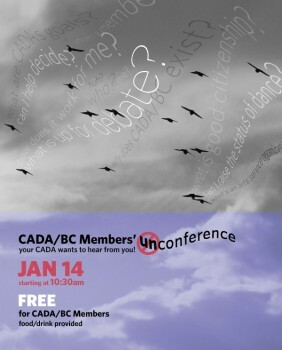 It will be a full day of discussions broken in three topic sessions directly related to CADA/BC’s programs: subsidization, dance citizenship and best business practices. This day is open to all of CADA/BC’s members. 7th floor of The Dance Centre. Come for the whole day or just the session(s) that interest you. RSVP required by January 9. Food and beverage will be provided at all breaks. After party alcoholic beverages available by donation. There are many ways that a career in dance can be subsidized, from the Training Subsidy Program, to the MSP’s premium assistance program, to retail discounts for Members. What aspects of subsidization are most important to you as your career develops? What does it mean to be part of a dance community? What is the most effective way to talk to each of the levels of government? We all struggle with the negotiation of looking out of our own careers while participating in a larger community. What does being a Member of an organization like CADA look like? How can we participate at our fullest? As our field evolves and deals with the ever changing economic environment, so does our business practices. Our wages, our employment terms, our working conditions are constantly under pressure. How would you like your business practices to grow? “Topic instigators” will have 2 minutes to present one idea that he/she is interested in exploring. After each instigator presents ideas, the group of participants will anonymously vote for up to two ideas to be further discussed. As a group we will discuss how much time we want to discuss these ideas and keep some time at the end of the session to write a « proposition » to bring back to the general membership at the end of the day. It is important that each topic instigator arrives prepared to both lead the exploration their own proposal and support the exploration of other ideas. “CADA Myth Busters” (board members) will be in the room and their role will be to briefly present CADA/BC’s current perspective on the topic. At the end of the day, participants of all sessions will be invited to unite in one studio to share a drink and review the day’s work. Topic instigators will present the proposals from their session and time will be allotted for the group to discuss the day’s process. The entire process will be documented by audio and in writing. Participate in one or all of the topic sessions and help shape the discussion around your area of interest. Volunteer to help with the documentation of the event or its coordination on the day of the unconference. Contact Kristina Lemieux to volunteer. Become a Topic Instigator? Is there an issue or idea you would like to discuss with your community in an open and facilitated forum? Please contact us by January 3, 2012 to confirm your interest as a Topic Instigator. CADA-BC is your organization. Let your voice help shape the organization’s activities.